On November 10, I returned from my year-long exile in Korea, living in Virginia with Miimii and the cats, but it was not home. I was depressed, bitter, lonely. I started work at the 30th Intelligence Squadron, about 1/4 mile down the road from my old office at the 480th Intelligence Group. I might as well have been in Korea because I never got a call from any of my old friends or co-workers. It was like old times in our townhome--a few days after my return, Miimii had another one of her massive asthma attacks. I rushed her to the hospital, and I don't know why this sticks in my head, but we drove to the Mary Immaculate Hospital, cruised the parking lot for five minutes and couldn't figure how to reach the emergency room. Miimii was very weak from lack of oxygen so I parked the car and carried her 600 feet to the emergency room. uniform Miimii asked me why I wasn't looking for an apartment. I told her I was waiting for the divorce to go final (so she couldn't legally get mortgage payments from me while I was paying for rent in an apartment). I didn't really think she'd do that but I was becoming very untrusting of everyone. Miimii got angry and began screaming at me again. I remembered July 1997, when she screamed at me all weekend, and decided I wouldn't put up with it. I used to beg her to stay, and after many episodes like this, I took a colder approach. Now that we were legally separated, I could do what I'd wanted to do all those years--leave. I told her,"I'll find a place tomorrow". The next day I signed a lease at Grafton Station apartments, the same place Miimii and I had lived in when we first arrived in Hampton Roads in 1994, and just 7/10 mile from her house. However, I couldn't move in until December 5. When I told Miimii I was moving in five days she said,"Oh...you didn't have to leave so soon". I told her I didn't want to spend one more day with her. 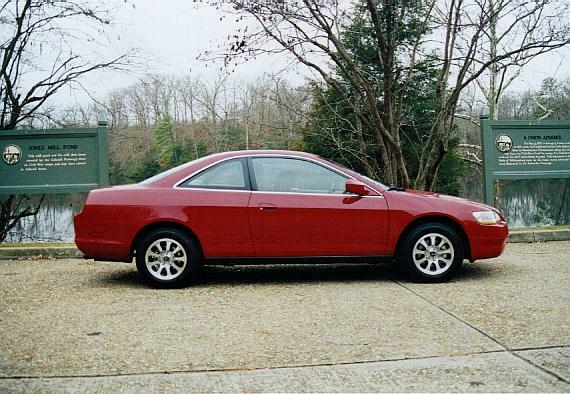 On December 3rd I traded in the blue 1992 Honda Civic LX family car for a 1999 Honda Accord V-6 Coupe. It was a real nice car...very pretty, very fast and very smooth. I'd made the deal over the phone at work during breaks--when I'd agreed to a price, I drove to the dealership, signed the papers, and on November 23, 1998, my Alexandria rolled off the assembly line in Ohio (yesterdy was her tenth birthday--I spanked her 11 times). Sometimes when you can't get what you need in life, you buy something you want but don't need to fill the emptiness. Alexandria (my car's name) was just that. My friend Melanie, a psychology major, told me Alexandria was my phallic symbol. I told everyone the same until, about two years ago, I found out what that actually meant. On December 5th I moved out. I didn't know anyone at work and wasn't in the best mood, so I decided to move by myself if it killed me. I had a heavy wooden dresser to move from upstairs down a narrow stairwell. I was very angry that day so I focused that anger. I flipped the dresser on its top and slid it down the stairs just as Miimii and her friends were sitting at the kitchen table talking and laughing. It hit the wall with a thud and they all went silent. I yanked at it, banged it, gasping and panting and loudly dragged it out the door, stood it on its end in my trunk and drove off with it sticking six feet in the air. I never bought a bed and still sleep on a mattress and box spring to this day. I just wanted away from her, and to not give her the satisfaction of screaming at me one more time. I finished the move on December 6, her 31st birthday. I was alone, but free. I wrote her a poem to hold out an olive branch but it was rather cold (see "30-wonderful" in "Only Words"---oh, well, I didn't include it). I emailed it to her from her own computer as I was clearing out the last of my things. It was the first poetry of mine she ever read (she had flatly refused to read anything I wrote). She didn't say she liked it, but she did print a copy. On December 12, Miimii and I drove out the the Colonial Parkway and shot photos of Alexandria and I together (see "Beginnings") for my 33rd birthday to send my mother. 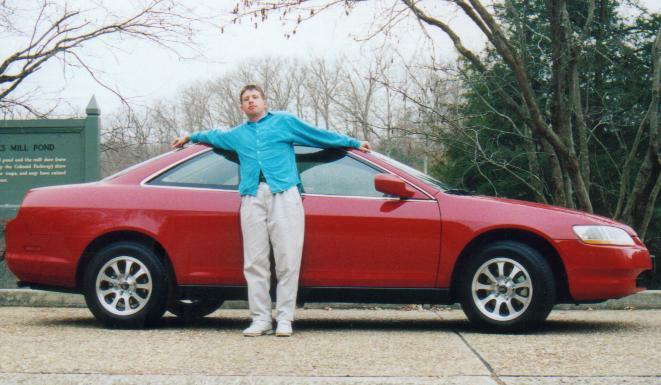 I tried to Miimiic the photo I shot on my 25th birthday with my new red Honda Civic Si in 1990, copying the pose and even wearing the same shirt. I still have the shirt. I bought it some super-cheap American Racing AR24 wheels for our first photo together.